Wilton Public Schools is very proud to partner with the Wilton Library on the Community Reads program. This year, the entire school community is involved in the community conversation on this important topic with age-appropriate titles, booklists, and programming at each of our schools. The selected title, The Tattooist of Auschwitz, by Heather Morris, will be the common experience book for students at the High School is based on a true story of courage, optimism, love, and survival during the Holocaust. It is a story that tells about the best of humanity during the worst of times. In this heart-warming, thematically rich book, the protagonist states that “each day you wake up is a good day”. Students will have the opportunity to read the book and meet the author on April 11th when she visits the High School during the school day. Wilton High School students are also recording oral histories of a number of Holocaust survivors and their descendants to create a documentary that will be shown to students. “With each passing day, we are losing the oral histories of Holocaust survivors and that cumulative voice of the generation that lived through World War II,” remarked Tai-Lauria. 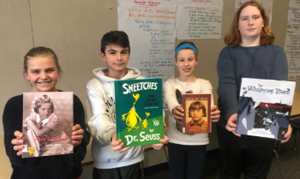 Beyond the High School, each Wilton school will focus on a book that covers important themes that were present during the Holocaust that is still with us today. At Middlebrook, two books have been chosen – they are Hana’s Suitcase by Karen Levine and Yellow Star by Jennifer Roy. Themes in these books are courage, hope, and survival. The author of Yellow Star, Jennifer Roy, will be visiting Middlebrook School on April 2nd. Raffles for book giveaways of both Hana’s Suitcase and Yellow Star will be conducted in the two weeks leading up to the author’s visit. At Cider Mill the book Whispering Town by Jennifer Elvgren has been chosen. Community guest readers will be invited to do a read-aloud for classes. Guest readers will include leaders from the community, parents, organization members, and district leadership. The book is set in occupied Denmark and tells the true story of a village that worked together and showed courage to help a number of Jewish people escape by boat to neutral Sweden. A gentle way to introduce children to the time, this picture book is told from the perspective of a young girl who was a “helper”. At Miller-Driscoll, Library Learning Commons staff will be reading The Sneetches by Dr. Seuss to all the students. This is a story that tackles prejudice and discrimination in an age-appropriate way for young learners. Details on all of Wilton Library’s programming can be found on the library’s website at The school district’s programming details may be found on the WPS website.